Ready to probe: The CardioArm can wiggle its way inside a body and perform cardiac ablations. An operator controls the robot’s motions using a joystick. A snakelike surgical robot from Carnegie Mellon University could let a surgeon performing a critical heart operation make just one incision. Known as the CardioArm, the curved robot has a series of joints that automatically adjust to follow the course plotted by the robot's head. This provides greater precision than a flexible endoscope can offer. "It's certainly easier to control," says Robert Webster III, a professor at Vanderbilt University who works on flexible medical probes and was not involved in the CardioArm project. 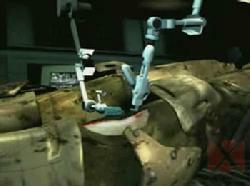 The CardioArm is operated using a computer and a joystick. It has 102 degrees of freedom, three of which can be activated at once. This allows it to enter through a single point in the chest and wrap around the heart until it reaches the right spot to, say, remove problematic tissue. "The nice thing about [the] design is that each joint follows where you went in space. That's not always possible in other designs," says Webster. 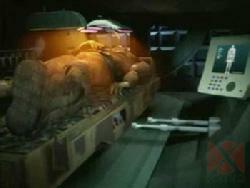 This kind of control prevents the probe from bumping into sensitive tissue. The disadvantage of a jointed robot, however, is that it's harder to miniaturize, Webster says. Snakes in hearts: The snakelike CardioArm moves around inside the membrane encasing a pig’s heart. 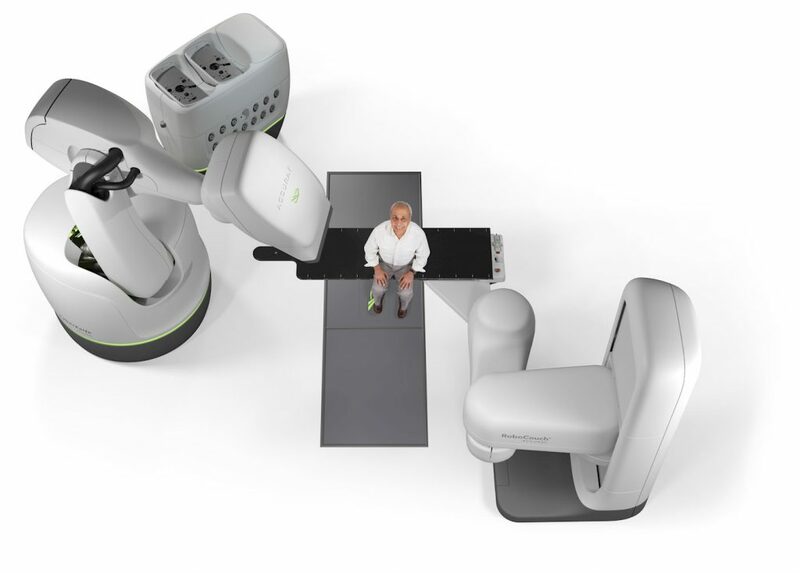 The NAVIO Surgical System features proprietary robotics-assisted technology that integrates handheld robotics with an intuitive CT-free registration and patient-specific planning process. The NAVIO TKA, UKA, and PFJ software applications guide the surgeon in creating implant plans that localize components and balance soft-tissue, and use handheld instrumentation uses multiple control modes to help the surgeon precisely prepare the bone for implantation. Smith & Nephew (LSE:SN, NYSE:SNN), the global medical technology business, announced it has completed the acquisition of Blue Belt Holdings, Inc. (“Blue Belt Technologies”), securing a leading position in the fast-growing area of orthopaedic robotics-assisted surgery. Blue Belt Technologies’ Navio surgical system currently provides robotics-assistance in unicondylar or partial knee replacement surgery through CT-free navigation software and a unique hand-held, robotic bone-shaping device. Navio and Smith & Nephew’s partial knee implant portfolio form a strong combined business from which to accelerate growth in this attractive area of surgery. 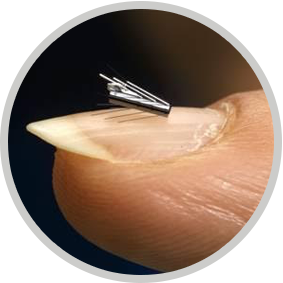 Additionally, the Group intends to expand the Navio platform into total knee, bi-cruciate retaining knee and revision knee implants, delivering significant further upside. The portable, stand-alone RoSS II™ console is a sleek redesign of the original RoSS™ that boasts improved graphics, enhanced visualization, smaller size, and decreased weight. 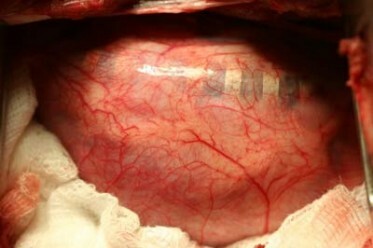 Created by Clement VIDAL and Patrick HENRI from Joseph Fourier University (Grenoble, France), a worlwide leader in computer assisted and robotics surgery, ENDOCONTROL is an innovative company offering robotized solutions for endoscopic surgeries. The SPORT Surgical System is a versatile single incision advanced robotic surgical system that features state-of the-art multi-articulated instruments with single-use replaceable tips, 3D high definition visualization on a flat-screen monitor, ergonomic open workstation and a single-arm mobile patient cart for ease of set up while enabling broad applications of single and multi-quadrant surgeries previously not possible with current robotic solutions. The FDA has given 510(k) clearance to Power Medical Interventions for the firm's iDrive Intelligent Power Unit, detachable Intelligent Surgical Instruments and iConsole device. The company believes that its powered tools, that sport a high level of articulation, can make a lot of difficult laparoscopies much easier to perform. A first-of-its-kind breakthrough in operating room instrumentation, the iDrive is designed to support a variety of minimally invasive procedures by offering surgeons a broad range of cutting and stapling configurations combined with increased flexibility, access and precision. The iDrive is a novel hand-held, computer-controlled power unit to which any of the company's Intelligent Surgical Instruments can be attached. 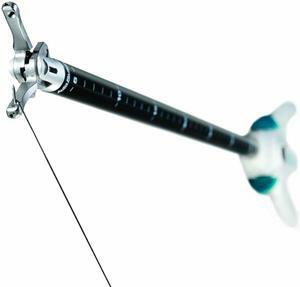 This innovation allows all of PMI's Intelligent Surgical Instruments to be driven by a single power unit. As a result, hospitals will be able to acquire PMI's advanced technology platform at less than half of the current cost, which may lead to significant savings for hospitals. The potential now exists for a comprehensive surgical solution that may be significantly less expensive than manual surgical stapling devices. In addition, the iDrive is reusable, easy to use, cost effective, and less wasteful, potentially leading to savings for hospitals and health networks. is a proprietary wireless device that communicates directly with the iDrive during surgical procedures to output specific auditory and visual reference information via its speaker and liquid crystal display. Outputs provide surgeons with important information regarding calibration, firing, and instrument and reload type, allowing surgeons to make real-time, critical decisions that may ultimately lead to an improved patient outcome. represents a dynamic technology solution which is designed to enable the incorporation of important functional enhancements. PMI intends to aggressively pursue and implement a variety of key enhancements, which ultimately could lead to offering surgeons the world's first wireless computer mediated platform with unprecedented capabilities such as wireless video processing, Internet access, a patient record interface and controlled tissue compression software. has recently been acquired by Covidien Surgical as an important part of a future "powered" business strategy. These innovative products and business strategies are evidence of Covidien's drive towards discovering and delivering advanced medical technology. To develop and launch these products, we work in diverse clinical and technological areas, embracing ideas and collaboration from around the world.